For more tips on creating with the border dies & foldout cards, watch the tutorial here. 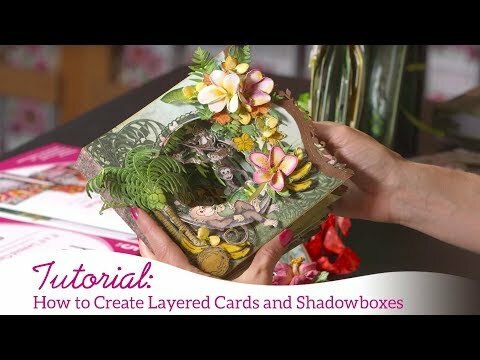 For more tips on creating with the layered card & shadowboxes, watch the tutorial here. Instructions: Follow Emma's video to first construct the layered card. Choose the papers from the Winking Frog Paper Collection for all the pages. Once you have decided the papers, stick them back to back with low tack tape and tape down the Eyelet Oval die in the center and run through the die cutting machine. Once all the papers are cut, glue them with the tacky tape or the adhesive that dries clear. Distress all the edges including the cut window with Peacock Feather Distressing Ink. For the flowers, stamp the images from Water Lily Cling Stamp Set with Archival Plum and paint it using Colorbox Berrylicious. Cut the images with its coordinating die and shape the flowers as taught by Emma Lou. Leaves are stamped with Library Green and colored using Fern Green and Leaf Green Archival Ink. Cut 2 pieces of Ornate Borders and Pocket Die from black cardstock and sandwich a light blue pattern paper between both pieces. Glue all the three and tuck the die element as shown. The seam binding ribbon is used to create the closure of the album.Cut the desired length of the ribbon and rub Peeled Paint Distress ink. Sprinkle some water and heat set it. The back page of the album has a pocket which is created using Delicate Basic Border die. For this cut a strip of 3 inches and cut the top edge with Basic Border Die. Cut the lacy border from black cardstock and glue from the back of the pocket.The back page of the album has a pocket which is created using Delicate Basic Border die. For this cut a strip of 3 inches and cut the top edge with Basic Border Die. Cut the lacy border from black cardstock and glue from the back of the pocket.